What’s the first thing you’d want to do, if a natural or man-made disaster struck your area – but you yourself were not immediately at risk? Social media has long been the first port of call for letting people know in a hurry, and Facebook has now formalised this use with a new feature announced a few weeks ago. 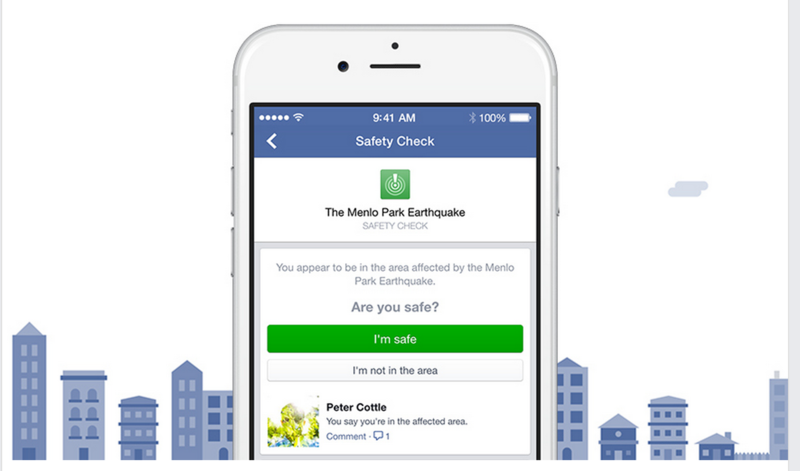 Safety Check, was unveiled by CEO Mark Zuckerberg at a press conference in Tokyo, the city devastated by a tsunami also in 2011, and is intended to help Facebook users quickly alert friends and family that they are safe during times of crisis. It works by sending users an immediate push notification asking them if they are personally safe whenever a natural disaster strikes the in or near area they list as their current location. Users can then also see a list of their Facebook friends in the area, and see which users have checked in as safe and which haven’t. It looks like it will be down to Facebook to determine what constitutes a disaster worthy of a check-in and this feature has not – thanks be – been put to the test by any real-world incidents yet. Marcy Scott Lynn, global policy programs manager at Facebook, stated that they will escalate incidents based on advice from local emergency services and authorities. The simplicity is quite elegant and designed for speed and immediacy, I can imagine it working well. Safety Check has a few extra features — for example, you can check in for a Friend, and Facebook will ask you to check in if it sees you are traveling in a compromised area — but it’s really designed for one a single purpose, sharing one simple status to everyone you care about: Yep, I’m fine. At present the tool isn’t integrated with any third parties such as emergency services themselves, so it won’t be able to shout for help or summon assistance. 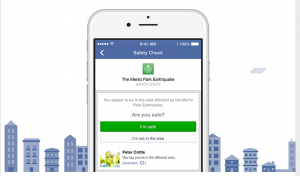 The idea for Safety Check came from Facebook’s Japan office following the 2011 earthquake and tsunami, hence the ultimate announcement in Tokyo. Facebook engineers at that time had developed a hasty disaster message board within the social network, to help families and friends connect in the wake of the devastation – but the tool was limited to Japanese users and usage declined as the region recovered from that specific incident. However a year or so ago the idea resurfaced and the project was picked up and revived during a company-wide hackathon at the company’s headquarters in Menlo Park. Facebook Safety Check is now live for all 1.3bn users. Social media has a vital role to play in times of crisis of course, due to the universality and immediacy of communications it offers. In the US, Japan and Korea Twitter has a specialized ‘alert’ feature which is available to specific verified users only (such as emergency services, law enforcement and selected government agencies) which pushes alerts to the homescreen of users’ phones and even sends SMS messages. It is not clear when this very useful feature will be extended to users in other parts of the world, because right now whilst Twitter is an essential source of news when you actively seek to find out about breaking disasters, you have to go in and search for it – individual announcements from specific accounts will be rapidly lost in the fire-hose of tweets. You also have to actively subscribe to alerts from each service and can choose whether to have it as a text or whichever is most likely to grab your attention. And remember when disasters are of terrorist or other unnatural causes then phone lines may be shut down deliberately by emergency services, as well as critically overloaded in affected areas. Using Facebook and Twitter to proactively get the word out even simply to say ‘I am OK folks’ is an excellent idea, as well as being the best way to find out what’s going on from those immediately involved as first responders. As we learned from the rapid spread misinformation in connection with the recent fire on Montgo in the Costa Blanca, social media can be the worst place for rumours and mistakes – but provided you check and verify facts before passing them on, you can use tools like Facebook and Twitter as a real source of immediate and effective communications when disaster strikes.